With Readly you can read Puzzles & Pastimes and thousands of other magazines on your tablet and smartphone. Get access to all with just one subscription. New releases and back issues – all included. An excitiing publication in a bookazine format that combines the knowledge of Unforgettable, who specialise in improving the lives of those affected by dementia, and the puzzle expertise of Puzzler. 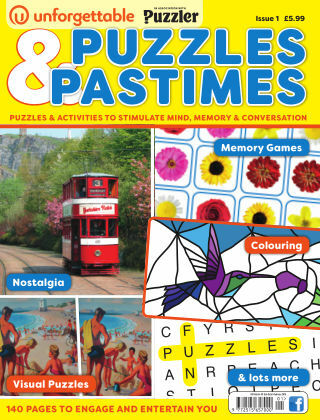 Puzzles & Pastimes includes 140 pages of puzzles and activities including visual puzzles, nostalgia, memory games and more, with hints and tips for carers on how to get the most out of the magazine. The colour pages are clear and help to create a calm environment, and nostalgic images are used throughout.